If you want anonymous results from Google you can use this simple DNS hack to get the results from Google. Since you will never be logged in you will always get clean results and also no searchwiki results. Never realized how much cleaner the results are if you are not logged in. 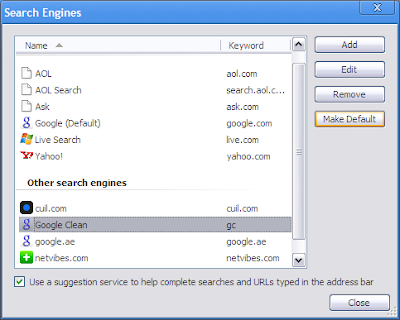 To get the cleaner results add the engine to Opera, Firefox, IE and Google Chrome. Its just a DNS hack so you still get all the results from Google. But its all anonymous since you never log in. All the traffic is sent to Google but the cookies are not set as you can never log in so more or less you can be anonymous. Its still a hack so it can be turned off by Google anytime. But its good while it lasts. This is what you see once you use Google Clean. You are never logged in so the results are anonymous and you will never get any SearchWiki results. You can always go back with a single click incase you want the SearchWiki results. Here is how you add it to Firefox. The search box should be a little blue. You can click it. 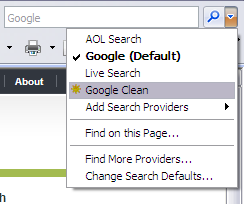 Select Add "Google Clean" from the menu and you will be done. Next time you search it will be a little more anonymously. The search box should be orange. 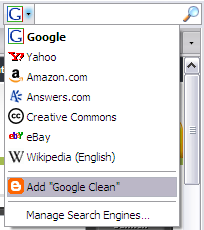 Click the orange button and select "Google Clean" from the menu. 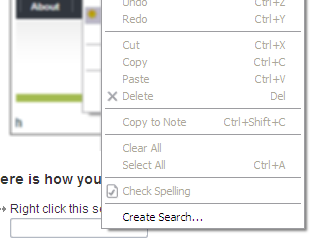 and select "Create Search" from the menu. Click details and select the following options. 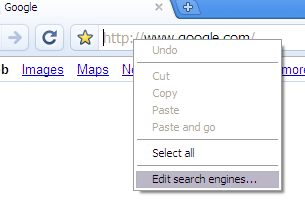 Right click on the address bar and select "Edit search engines.."
Add the following in the textboxes. There is no proxy or anything in between. The information is not being passed through my servers. My server cannot handle this much load. Its a simple DNS trick. 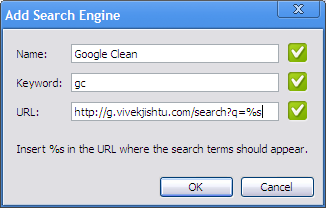 http://g.vivekjishtu.com/ directly points to http://google.com. So all the traffic goes to Google. But since the domain name looks different you are never logged in. You could very well use the IP address like 209.85.153.104 and it would do the same thing. But since google servers will try and choose the servers nearest to you its best to use a domain name. 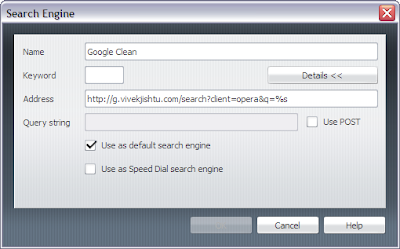 The domain name g.vivekjishtu.com gets resolved to www.google.com and finally to the IP address. Before leaving for Oslo I had updated my laptop and the update screwed up the WiFi drivers and it was impossible to get online. I had to completely reinstall everything. I ended up spending the whole night trying to fix it. If you want to use anything besides the default settings you need to know a few shortcuts Alt + F2 is a life saver to start with. This will popup the run dialog and you can start bash in a terminal and move forward from there. Everything on Linux seems to be super sized. The default font size is 12px nd that seems so weird. The next thing I do is do bring down the size to 8px and change the font to closely match Tahoma 8px. I am so used to it that anything other than this seems so ugly. Also not to forget the command "xfce-setting-show" which will enable the menu when you right click on the desktop. It will give you a menu like the start menu. You can also add/remove programs in the setting menu. For me the main application that I have to install is rdesktop which lets me remotely log into my main laptop and I can use the complete experience without carrying all the bulk with me.